This was such an easy dinner and it tasted amazing! Not only is this a 5-ingredient meal, but it only took 20 minutes. You read that correctly, it only took 20 minutes! 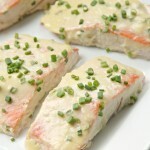 Just mix a few ingredients together to make a homemade honey mustard sauce, spread it on the salmon and bake. The sauce is so flavorful. It’s a little sweet and a little savory and so yummy on the fish. Enjoy! Preheat the oven to 375 degrees. Line a baking sheet with tin foil, and lay the salmon, on top, skin side down. Combine the greek yogurt, mustard, honey and chives in a small bowl and stir to combine. Spoon half the sauce over the fish, reserving half the sauce for later. Sprinkle salmon with salt and pepper, to taste. Bake in preheated oven just until the fish is opaque in the center, 7 minutes. Increase the oven to broil. Broil the fish for 5-6 minutes, keep your eye on it so it doesn't overcook. Garnish with chives and serve with the reserved sauce.